When you send an email, your recipients see the subject line, preview text, from name, and from email address first. It's important for these details to be recognizable and consistent, so recipients are more likely to open your campaigns. When and how you edit this information depends on the type of email campaign you're working with. In this article, you'll learn how to edit your subject line, preview text, from name, or from email address in different types of email campaigns. If you regularly use the same from name or email address when you send to a specific audience, you can set them as campaign defaults to improve consistency and save time. To learn more, check out our article on how to Change Audience Name and Defaults. If you want to display preview text in a custom coded campaign, add our preview text merge tag to your campaign's HTML. You can edit any part of a regular email campaign while it’s in draft status. You’ll edit the from name and from email address in the From section of the campaign builder, and the subject line and preview text in the Subject section. After you send, you won’t be able to change these details. To edit the from name or from email address for a regular email campaign, follow these steps. Click the name of the regular email campaign draft you want to work with. In the From section, click Edit From. Enter the name and email address you want to use, and click Save. You may be asked to verify your email domain. To find out why, check out Verify a Domain. If your from email address comes from a free email service, it may cause delivery problems. To ensure delivery, we'll make a small change to your email address by adding an extension to it. To learn more, check out our article on how free email providers affect delivery. To edit the subject and preview text for a regular email campaign, follow these steps. Enter the Subject and Preview text you want to use, and click Save. 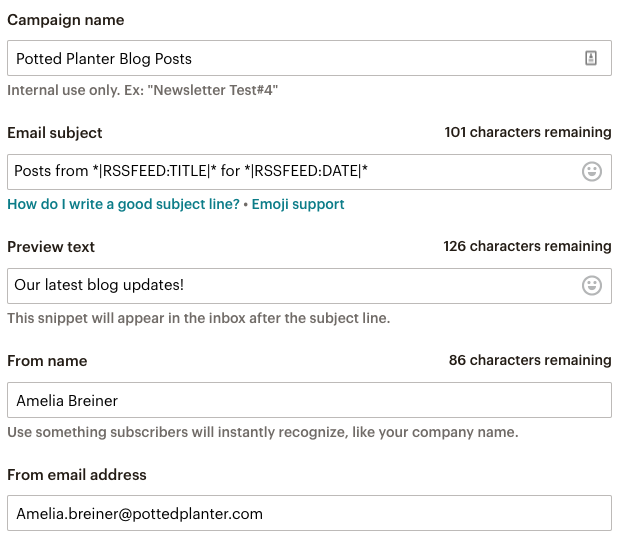 You can edit automated email campaigns, including RSS campaigns, even after they’ve started sending. The way you’ll edit them depends on the type of campaign you’re working with. To edit the subject line, preview text, from name, or from email address for a specific email in an automated workflow, follow these steps. Click the name of the automation you want to work with. If your automation has not started, click Design Email for the specific email you want to work with. To edit an email in an ongoing automation, first click Pause & Edit, and then Edit Email. 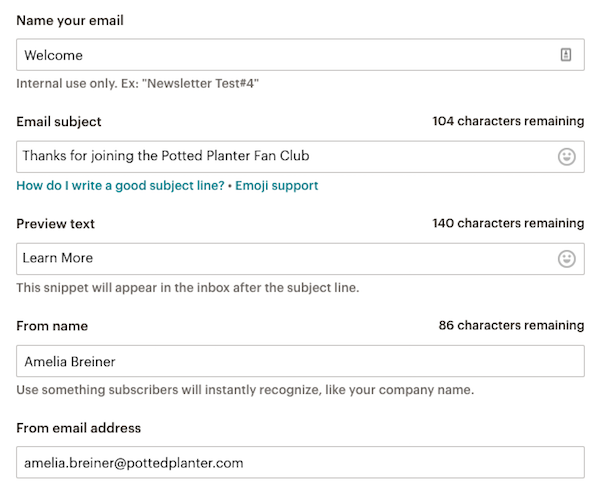 In the Email information section, input the Name, Email subject, Preview text, From name, and From email address for this email. Make any other desired changes and continue through the Builder. 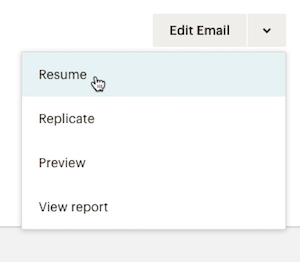 If you're working with a paused email, click the drop-down menu and choose Resume to start sending again. To edit the subject line, preview text, from name, or from email address for an RSS campaign, follow these steps. If your RSS campaign has not started, click Edit for the campaign you want to work with. To edit an RSS campaign that has already started, pause the RSS campaign you want to work with. In the Campaign info section, input the Name, Email subject, Preview text, From name, and From email address for this email. Certain automated email campaigns have their own unique builder. Take a look at our step-by-step instructions on how to create and edit abandoned cart messages, order notifications, and product retargeting emails. Our Knowledge Base contains additional resources to help you build your email campaigns. After you’ve learned how to edit your subject line, preview text, from name, and from email address, you may want to try some of these tasks.